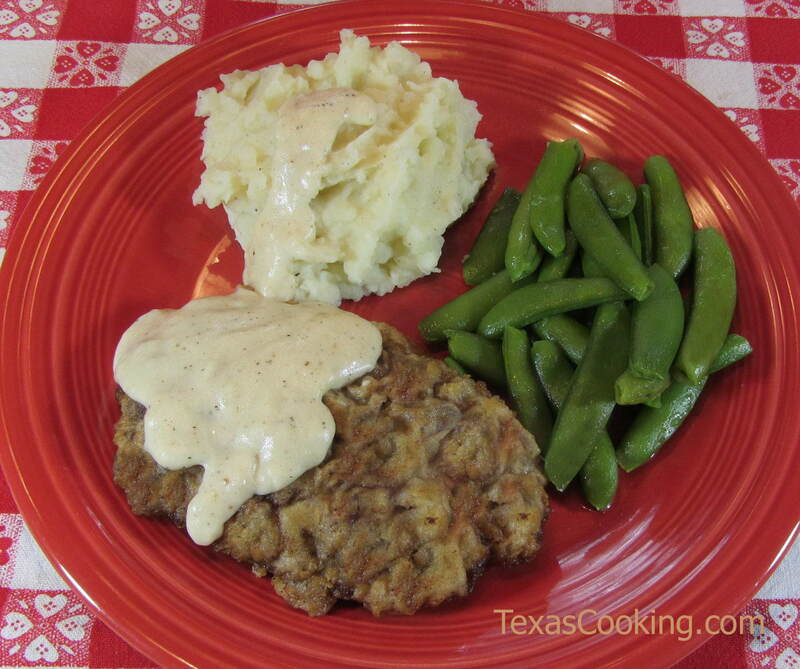 It is hard to get much more Texan than Chicken Fried Steak. Quality of the beef really counts in this dish. This recipe calls for cube steaks, but good round steak that you have asked the butcher to run through the tenderizer or that you have tenderized yourself with a mallet (no big deal and can be a real stress reliever) can be even better. Lots of people deep fry chicken fried steak, but I believe pan-frying produces a better steak. Your end result should be a tender steak with a coating that's golden and crispy. Beat together the egg and milk and pour into a pie pan or other flat pan; set aside. Mix together the salt, black pepper and white pepper and sprinkle on both sides of beef cutlets. Oil should be a little less than a half-inch deep in the pan. Fry cutlets on both sides, turning once, until golden brown. Reduce heat to low, cover and cook 4 or 5 minutes until cutlets are done through. Remove cover from pan during last few minutes of cooking. Drain cutlets on paper towels. After the cutlets are removed from the pan, pour off the pan drippings, reserving 2 tablespoons. Keep as many as possible of the browned bits in the pan. Return the reserved oil to the skillet, and heat oil over medium-high heat until hot. Sprinkle 3 tablespoons flour (use the left-over flour from the chicken fried steak recipe) in the hot oil. Stir well with a wooden spoon, quickly, to brown the flour and form a roux. Gradually stir 1-1/2 cups milk into the roux, stirring constantly with the wooden spoon, mashing out any lumps, and bring to a boil. Continue stirring a few minutes as gravy thickens and reaches desired thickness. Check seasonings and add ground black pepper and salt to taste.